African Americans comprise a much higher proportion of the end-stage renal disease population compared to the percentage in the general population. 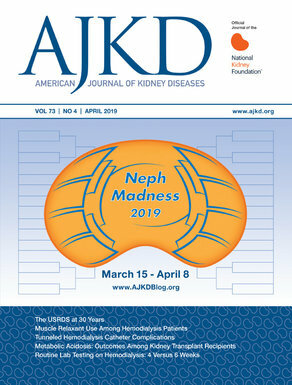 The observation that patients with two risk alleles for apolipoprotin L1 (APOL1) are associated with ESRD associated with focal and segmental glomerulosclerosis, HIV associated nephropathy, and non-diabetic chronic kidney disease has greatly extended our understanding of the observed differences in renal outcomes for different racial groups. During the Late Breaking Trials presentations at ASN 2013, Parsa and colleagues presented their analysis of the APOL1 alleles associated with renal disease in secondary analyses of two large cohort studies, the African American Study of Kidney Disease and Hypertension (AASK) and the Chronic Renal Insufficiency Cohort (CRIC) studies. In the AASK cohort, having two copies of the disease-associated APOL1 allele was associated with a statistically significant increase in the rate of progression to ESRD or doubling of serum creatinine (hazard ratio 1.9) when compared with patients with either zero or one risk allele. In the CRIC cohort, African American patients with the two risk-associated alleles for APOL1 also had statistically faster rates of GFR decline as well as in the composite outcome of ESRD or doubling of serum creatinine. Importantly, these findings were true irrespective of presence or absence of diabetes as a comorbid condition. Overall, this study extends our understanding of the association between APOL1 gene variants and the development of clinically significant renal outcomes among African Americans. Although further research is needed to understand the mechanism by which these allelic differences are linked to poor renal outcomes, the presentation by Parsa and colleagues takes us another significant step forward in this developing story. Post written by Dr. Craig Gordon, eAJKD Contributor. Check out more coverage of ASN’s Kidney Week 2013 at eAJKD and @eAJKD on Twitter!